Across the world one can find people from all cultures wearing their hair in the form of dreadlocks. This hairstyle was made famous by Rastafarians, a small Black Nationalist sect indigenous to Jamaica, whose theological foundation is influenced by Judaic Old Testament scripture. 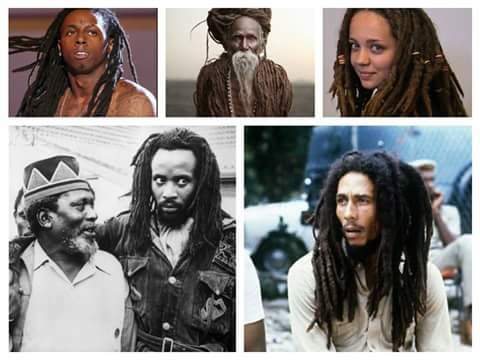 Though humans have worn dreadlocks since the beginning of recorded history, it is the world’s exposure to Rastafari via reggae that influenced many to wear this hairstyle, which was once seen as formidable and “dreadful” by the establishment during the Colonial periods. Despite Jamaica’s predominate population of African ancestry, the Europeans’ ideology governed Jamaica with an immense grip during the inception of Rastafari. During colonialism, Jamaicans received an education that exalted England while professing disdain for anything African. The result was a population of Africans who found the attainment of the European lifestyle to be the epitome of life. Government officials met Rastafarians with immense oppression, prohibiting Rastafarians from partaking in all aspects of society, mocking their beliefs and appearance, and cutting the locks of earlier converts. 1. Some historians claim the hairstyle was derived from Old Testament Biblical text, specifically the Nazareth creed that instructed against the trimming of the hair and beard of believers. “During the entire period of the Nazarite vow, no razor may be used on their head. They must be holy until the period of their dedication to the Lord is over, they must let their hair grow long.” ~ Numbers 6:52. 2. Other historians give responsibility to Indian indentured servants who not only brought the famed curry and marijuana to Jamaica but also the practices of Indian shamans called Sadhus. Sadhus have existed in India for thousands of years, shunning worldly possessions, wearing their hair in dreadlocks, while constantly smoking copious amounts of marijuana to elevate their consciousness within the unconscious world in which they were forced to live. 3. The final theory, which I believe to be the most plausible, comes out of Africa. Note there were Africans who lived in what is now modern-day Nigeria with great similarities to Indian Sadhus, wearing dreadlocks, shunning worldly possessions, but they are not the source of inspiration. Mau Mau’s dread hairstyle was not worn for fashionable reasons but for survival purposes while engaging in ferocious guerrilla warfare against British funded military K.A.R (Kings African Rifles) that used vicious brutality to subdue the Mau Mau. The Mau Mau were the main reason for the independence of Kenya, though credit is given to Jomo Kenyatta despite his public denouncement and criticism of the Mau Mau. Kenyatta was also incarcerated and depressed during most of the freedom struggle. Followers of Leonard Howell, one of the forefathers of Rastafari found great pride in the news clippings they received of Mau Mau resistance and found dreadlocks as both a symbol of anti- colonialist demonstration of self-love and self-acceptance while inflicting dread inna Babylon.